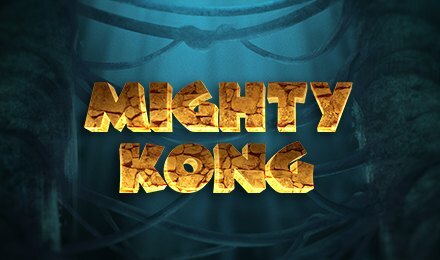 Meet the giant gorilla on Mighty Kong Slot at Vegas Spins. It is a creation of Pragmatic Play, with 5 reels and 50 paylines. This game is based on the story of King Kong, a giant gorilla on Skull Island. According to the story, it was captured and brought to New York to entertain the locals. On the background, find a dense forest with the reels enclosed within film reels. ,br/>Matching with the theme, find symbols like Ann Darrow, Carl Denham, Jack Driscoll, 10, K, J, Q and A on the reels. These symbols award up to £50, £25, £12.50, £7.50, £5, £4, and £3.75 for 5 of their kind. Form winning combinations of these symbols as you spin the reels. Your aim in Mighty Kong slots is to form winning combinations with similar symbols to trigger a win. Use the + and – symbols to set your bet levels and wagers. The autoplay option also allows you to set auto spins ranging from 10, 20, 30, 50, 70 or 100 games to play per spin. Bet Levels: Set your bet levels from between 1 to 10. Amount of Paylines Selection: All 50 paylines remain fixed. Coin Values: Default coin values range from; £0.01, £0.03, £0.05, £0.10, £0.20 and £0.50. The wild symbol is represented by WILD, which replaces all other symbols bar the scatter symbol. When the wild lands on reel 3, it expands to cover all positions on the reels to increase winning potential. The scatter of the game is represented by King Kong himself, and he triggers the Free Spins Feature. Landing three, four or five scatter symbols anywhere on the reels to trigger the Free Spins Feature. Three or more of these symbols will activate the feature in which you get to pick out the amount of spins you would like to play plus the multiplier amount.